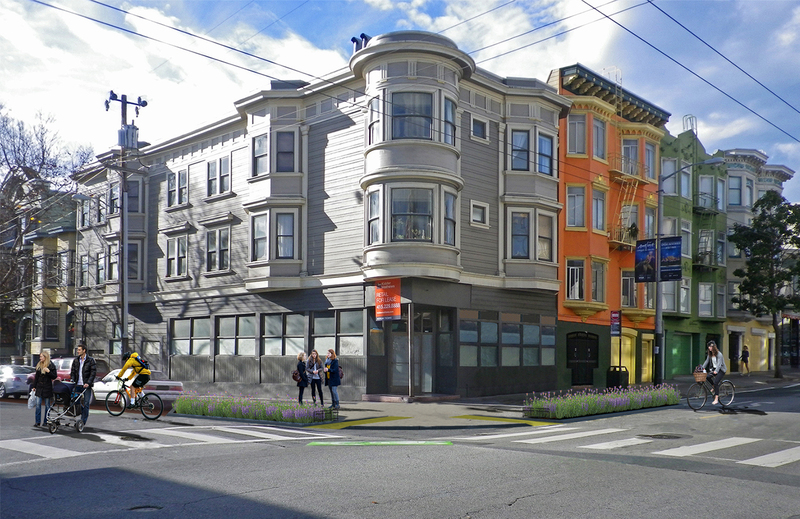 The Wiggle is set to become a calmer, safer, and greener route after proposals presented by the SFMTA yesterday, with improvements like raised crosswalks, bulb-outs with greenery, textured pavement, and a traffic diverter at Scott and Fell Streets. The diverter, which would prevent drivers from entering the block of Scott between Fell and Oak Streets in the southbound direction while allowing bike and foot traffic, is expected to lighten car traffic on Scott and facilitate the left turn into the Fell Street bike lane. Although the SFMTA has installed a protected left-turn signal there, some bike commuters continue to make the short-distance turn against a red light, when drivers have a green light to turn left on to Scott into their path. Under the SFMTA’s plan, an “extra-large bulb-out” with planters would physically block drivers from making that left turn. An overview of proposed Wiggle improvements. Click ##https://www.sfmta.com/sites/default/files/projects/WiggleProposalSummary.pdf##here for full PDF##. Along the rest of the Wiggle, traffic-calming measures — for both cars and bicycles — would include five raised crosswalks. In addition, the hairy intersection of Page and Steiner Streets would see every crosswalk raised, along with “textured pavement.” One new measure for the city, aimed particularly at calming bicycle traffic, would be “speed reduction stripes” — “narrow strips of paint or textured pavement” — installed on approaches to crosswalks in nine spots. Bulb-outs, many of which would include “rain gardens,” would be installed at corners on the west side of Oak and Scott Streets, the northeast corner of Scott and Haight Streets, the southwest corners of Pierce at Haight and Page, northeast Pierce and Waller, and southwest Waller and Steiner. Those are in addition to the “extra-large” bulb-out at Scott and Fell. Some attendees voiced concern about the traffic signals that would replace stop signs at the Haight intersections with Pierce and Scott, planned separately as part of the Muni Transit Effectiveness Project. The signals would have transit priority (turning green for buses), but it would be a change from the current take-your-turn system, adding wait times for people walking and biking, and possibly encouraging speeding through the intersections to beat the lights. The Wiggle plans are expected to head to the SFMTA Board of Directors for approval near the end of the year, and construction is scheduled throughout 2016. “We’re hoping that it keeps moving on a track towards actual implementation,” said Shahum. Kudos, SFMTA. This is a wonderful project. It makes sense in this case to get bikes off Haight so as to reduce conflict with buses given that the alternative is just as good. I’m not sure rejiggering light timing will be enough to fix Divisadero (without also getting rid of some left-hand turns) but am looking forward to see what results it produces. Am also skeptical about the “speed reduction stripes” to slow bicycles. Won’t bicycles just divert into the road to get around them? Great plan, especially the traffic diverter on Scott. It’s rare I see plans these days from the MTA that truly prioritize anything but the automobile. I love seeing all the greenery and water-permeable surfaces — this is a hugely under-rated issue. yet still allow bicyclists to not have to stop if there’s no traffic. Of course, these roundabouts would also need to make the crosswalks raised and highly visible to make it clear that pedestrians get absolute priority. 1) They’re looking at piloting the stripes. I agree it could be too much of a hazard for bikes, so the hope is the pilot can tweak the design in the short-term and have them be figured out by the time full construction is underway. 2) I was skeptical about the traffic-calming measured, but from talking to the traffic engineers, what’s happening is that there is no prioritization of traffic at the moment. What they’ll do is prioritize southbound traffic, meaning if you’re going south on Divisadero in the mornings (now that you can’t take Scott), you’ll get all the green lights. It makes sense to me, and the fact that it isn’t happening right to makes me feel like it could work. Funny that the first picture still shows curbside parking on the west side of Scott. How will people legally access those spaces (although we already know how people will really access them). Although it is legal to turn left across a double solid yellow to enter a driveway, it is illegal to make a u-turn/3-point turn here unless done at the intersection. However, since there will be the traffic diverter at Scott and Fell, it will be not be possible to make a legal u-turn to access curbside parking. With a traffic signal going in at Haight and Pierce, I hope MTA is planning to move the stop to the far side of the intersection. Time to buy property on a particular block of Scott Street, methinks. These kinds of improvements are going to send property values upward. Now, about that 20% down payment…donations gladly accepted! What is amusing is we were trying in 2011 to put a street park on Noe in Noe Valley and multiple homeowners on that street asked “What will the City do to compensate for the reduction in our property values”. Andres Power said “our experience is that projects like this increase property values” to a chorus of catcalls. “Mini Roundabouts” were tested on the Wiggle about 10 years ago, and proven to be extremely dangerous for both bicyclists and pedestrians. The issue was the circles were too small to significantly slow down the cars and drivers just blasted through the intersections at almost full speed. I am kind of worried about this part of the project. I will not want drivers to be encouraged to make u-turns on a narrow street with lots of bikes. It seems like will only be a matter of time before a cyclist gets run over. Exactly, they were small because SFFD, no? Yep: that is classic SF-screwing-up-the-roundabout. The have something similar out in the Sunset. I true roundabout is not a little dot in the middle of the intersection which is the inane way the MTA keeps doing it. It is a big enough circle that you can’t possible blow through intersection without drastically slowing down or else smashing into the island. So I agree that they have to be done right. Also, they need to be rolled out all over one neighborhood and explained in driver’s ed so that drivers start getting used to them. And again, they really need to be designed to prioritize pedestrians which means clearly-visible sidewalks, elevated crosswalks, etc. If you look at the way roundabouts are used in Europe, they are typically not put on narrow residential streets in the way suggested here. Rather they are put on major highways. Put another way, they are not used as traffic calmers at all, but quite the opposite. The point of them is to keep traffic moving more freely and to enable vehicles to not have to stop if the way forward is clear. And that’s why the mini roundabouts failed near the Wiggle. They encouraged cars to not stop where previously they stopped. You argue that they are better because they mean that bikes do not have to stop but that is also their problem. In fact, more generally, roundabouts are pedestrian-unfriendly precisely because walkers can no longer rely on street traffic stopping. If you think roundabouts are pedestrian-friendly I encourage you to take a look at some of the gyratory systems (as they are called) in London. Pedestrians take their life in their hands trying to navigate those. This is the problem with really poor implementation of a street design with no analysis of what works in other places and no modification based on reality/feedback. I’ve seen roundabouts work beautifully in Seattle, Sedona and all over Europe. They have to be designed to fit their specific application. For low traffic streets they absolutely must be large enough to neck the street down enough to slow down traffic significantly (under 7mph). For high-volume streets they need to slow down traffic moderately (under 12 mph) but allow bikes and pedestrians to cross well before or after cars enter/exit the roundabout. See photo of this roundabout in Amsterdam (from http://bicycledutch.wordpress.com/2013/05/09/a-modern-amsterdam-roundabout/) and this one in a Seattle neighborhood. 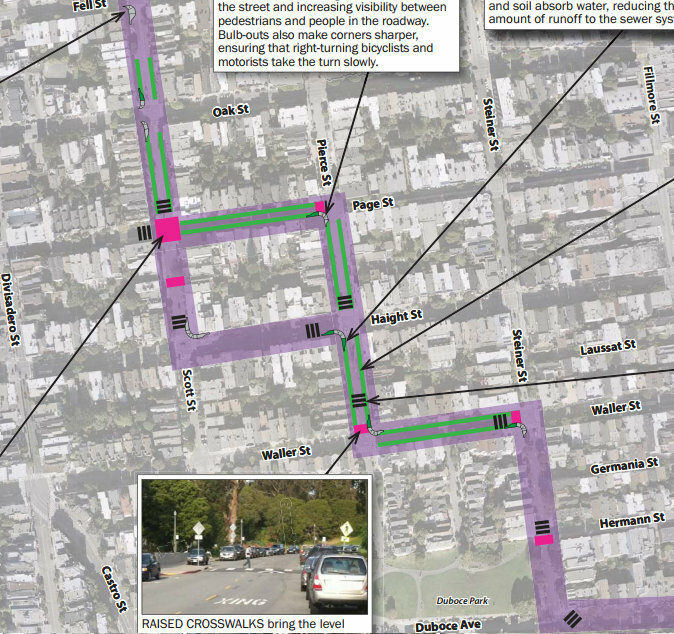 Yes, Divisadero needs a lot more than some light phasing to make it work. right now if you have a vehicle waiting to turn left and another trying to turn right and waiting for pedestrians, the entire thoroughfare snarls up. Throw in a ponderous muni bus and a double-parked delivery truck and it gets worse. And yet this is supposedly the major north-south arterial route between Masonic and Gough/Franklin. It’s problem, of course, is that it is just two lanes unlike those others which have three. It doesn’t work. Pushing more traffic onto it will just make it worse. Which will lead to even more frustrated drivers. which will lead to, well, you know. Finally, if a stop sign won’t slow down bikes, then why would a friendly yield sign? As with anything else, you have to use the right tool for the right job. The UK doesn’t really have a concept of 4-way stops. They use either lights, a roundabout, or just have “Yield” signs on the minor street – more like our 2-way stops. But having driven extensively there, I can say that I haven’t seen them much on quiet residential streets. They are usually on highways. I cannot speak for other nations in Europe, however. Personally I think that circles are great for keeping traffic moving, although they can require some skill to navigate. But I do not think they do a good job of calming traffic, which was the point here. Whether large or “mini”, pedestrians are better off with stop signs or lights IMO. The desired behavior is for bicyclists to yield to pedestrians. For a bicyclist to yield to a pedestrian rarely requires stopping but it does often require slowing down. I yield to pedestrians by slowing down as I approach crosswalks half a dozen times every time I ride my bike. I could race to the crosswalk, slam on my brakes and stop (as cars are wont to do) but that makes absolutely no sense on a bicycle, as anyone who has ridden one knows. Cars are a somewhat different matter because they have blind spots that bicyclists don’t, although you will notice at the average intersection when there are no other cars, 90% of cars in SF will not come to a complete stop but roll through at 2 – 10 mph. I would argue that cars need to travel through intersections even more slowly than bicyclists (2 -5 mph). Due to their mass, acceleration ability and blind spots, drivers need to be studiously careful to keep from killing people. A bicyclist can indeed be dangerous to a pedestrian when the cyclist is already traveling at high speeds (or flying downhill.) But a cyclist who has slowed down to 5-7mph can simply not get going fast enough soon enough (and combine that with a fraction of the mass) to endanger a pedestrian the way any car can when the driver punches the gas pedal. So how to slow bicyclists down and ensure they yield to pedestrians? First of all, focus on the important behavior–yielding, not stopping. Secondly, design the street to reduce speeds. The raised crosswalks in this design will act as a kind of speed hump and perhaps secondary speed humps will be necessary as well. There may also initially (and perhaps, later, randomly) need to be police enforcement stings giving tickets to bicyclists who fail to yield to pedestrians. This would be worthwhile police activity. Ticketing bicyclists for not stopping at four-way stops designed for the realities of 3000 – 8000 lb vehicles is a waste of their time and taxpayer money. It does indeed depend what you meant by “roundabout”, and a mini-roundabout or standard roundabout is so completely different from a roundabout interchange (“gyratory”) that it’s completely misleading to use examples of the latter to make generalizations about the former. The Hanger Lane gyratory is London’s equivalent of the Cesar Chavez/US-101″Hairball” interchange. It would never be used on Haight St, so why even mention it? Mini-roundabouts are used extensively on quiet residential streets in the UK, and you are simply incorrect to state otherwise. I base this knowledge on having lived there for 24 years, and having learned to drive there. I think mini-roundabouts would work well on the wiggle, though intersections on Haight St itself would be probably be better with traffic signals that give priority to Muni. The main obstacle to using mini-roundabouts in the US is driver education. Roundabouts require drivers to stop when a pedestrian is preparing to cross the street, or another vehicle is on the roundabout. A properly designed roundabout offsets the pedestrian crossing from the roundabout by a car’s length so that drivers do not have to look out for pedestrians and traffic at the same time; first they yield to pedestrians at the crosswalk, then they yield to traffic at the roundabout entrance. See the diagrams on this page: http://safety.fhwa.dot.gov/intersection/roundabouts/fhwasa10007/ Also note their recommended usage is for “Space-constrained locations with reasonable approach speeds”, “Residential environments”, and “Intersections with high delay” – all of which apply to the wiggle. Trouble is, US drivers have a tendency not to stop for pedestrians waiting to cross the street at crosswalks, and don’t expect to see crosswalks in any place other than at the intersection itself. If these designs were more common, and if the rules regarding pedestrian right of way were actually enforced by SFPD, this wouldn’t be such an issue. Another issue is that drivers turning left might just drive over the painted dot in the middle of the road, even though you are supposed to treat it as if it were a physical barrier. (I think if you tried to make it a physical barrier, SFFD would be up in arms, with some justification.) Again, better driver education would be needed, and more use of standard roundabouts with solid circles in the center at intersections where there is space to do so. Well, jonobate, I guess we both just drive in different parts of that country because, whether the UK roundabouts were large or small, I saw nothing like the ones that were tried in the Lower Haight a few years ago, which were a failure. Now part of that might be a lack of driver education, but I’m not clear how we could justify the cost and effort of teaching every driver how to navigate a roundabout when we’re only talking about a handful in just one area. Roundabouts exist to speed up traffic, and not to calm it. If I had to categorize the winners and losers out of roundabouts, I’d say that they are better for cars, neutral for bikes and worse for pedestrians. If we want safer streets then we do not want to give vehicles excuses to not stop at intersections. Small roundabouts in the UK usually come in form of painted mini-roundabouts, rather than the small physical roundabouts that were tried in the Lower Haight. You might not consider those to be roundabouts, but that’s what they are. I’ve driven all over the UK, so I strongly doubt it’s due to regional variation. Driver education regarding roundabouts would primarily be focused on getting drivers to yield at crosswalks without a stop sign, which is something US drivers are generally not used to doing. Personally I think that’s a worthy aim in and of itself. Driving around a roundabout is not exactly rocket science; include some good signage, and perform some outreach/enforcement when it first goes into effect, and you shouldn’t have a problem with the navigation aspect of it. The safety benefits of roundabouts come from the fact that all road users have less points of conflict. The reduced points of conflict mean that it’s now safe for traffic to keep moving rather than come to a complete stop (providing they yield when appropriate, of course.) The two diagrams below illustrate this. I would say that roundabouts are better for everyone if implemented correctly. It’s a bad idea to mix bike lanes with roundabouts, but when bikes are in mixed traffic (as on the wiggle), cycling conditions are greatly improved. By my measurements in Google Maps, that UK intersection has two roads which are ~35 feet wide, of which ~12 feet is sidewalk and ~23 feet is roadway. By comparison, Page is 70 feet wide, with 30 feet of sidewalk and 40 feet of roadway, and Scott is 25 feet of sidewalk and 45 of roadway. The fact is that there are few residential streets that are as narrow as the typical UK residential street in San Francisco, and fewer still intersections of two of them. Even though they appear to have the same number of lanes, save for the bike lane, Scott is literally twice the width of the UK streets. Any comparison has to take this into account. One result is that crossing the street takes significantly longer here, and drivers are able to drive much faster, with lanes that are as wide as those you find on a freeway. That last point probably accounts for why we have so many stop signs.